FIGURE 12.6.1. 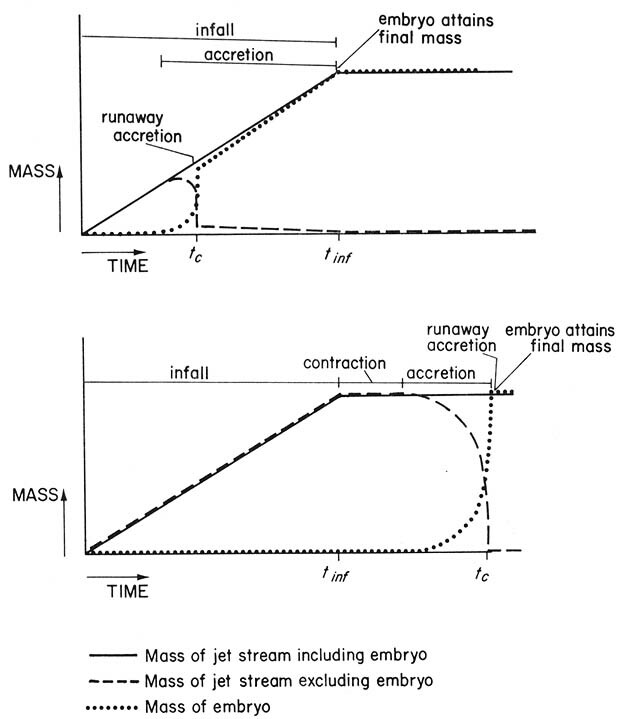 Schematic representation of the accretion of an embryo from a jet stream. Plasma emplacement and infall of grains to the jet stream occurs during the time tinf. The accreting embryo at first acquires mass slowly hut then reaches catastrophic accretion at time tc when all mass present m the jet stream is accreted by the embryo. For me case tinf > tc, a slow rate of accretion continues after the runaway accretion occurs. The slow accretion continues until plasma emplacement has ceased. For the case tinf < tc, as illustrated in the lower graph, after emplacement ceases and contraction of the jet-stream volume by negative diffusion increases the density in the jet stream, accretion commences and culminates in catastrophic accretion.